Choir practice in a church makes sense, unless it is the Gilroy High School choir, which was told it was no longer allowed to utilize church buildings for practices or performances as mandated by the Superintendent, according to Jeremy Tedesco of Alliance Defending Freedom. 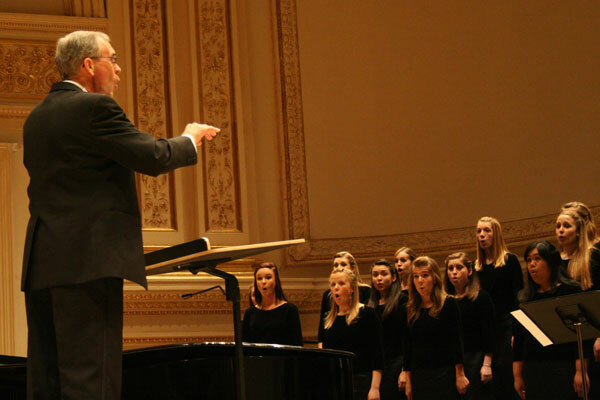 Gilroy High School choirs have been performing for years in acoustically superior facilities, ranging from a variety of church buildings, to the South Valley National Bank and the Elks club, to showcase their exceptional talent in the best facilities. The district is updating their facilities and talking to acoustic experts to make their own facilities a better place for the choir to practice, according to Jaime Rosso, Board President of Gilroy Unified School District. The board says it desires the students to use the facilities that are available in the school district. Yet in the mean time, the choirs miss out on great sounding venues due to a few misguided complaints, and a Superintendent who does not understand the Establishment Clause. In a letter written by Jeremy Tedseco to the School board, he states that the nature of choosing a variety of neutral venues, based on the excellent acoustics upholds the Establishment Clause, and by denying the choir access to these venues, the School District may very well be violating it. Rosenberger, 515 U.S. at 839 ( “[A] significant factor in upholding governmental programs in the face of Establishment Clause attack is their neutrality towards religioñ’); see also Gaod News Club, 633 U.S. at 114 (“For the `guarantee of neutrality is respected, not offended, when the government, following neutral criteria and evenhanded policies, e~ttende benefits to'” religious and secular beneficiaries alike). The board is re-evaluating their decision according to Central Coast News and will allow the choirs to practice in whatever facility they desire until the school buildings are renovated and the acoustics meet a higher standard. This entry was posted on Friday, November 1st, 2013 at 3:14 am	and tagged with Alliance Defending Freedom, California, Education, Establishment Clause, Gilroy and posted in California, Education. You can follow any responses to this entry through the RSS 2.0 feed.